You must certainly be using Google Analytics in your website. After all, this tool can be very useful when you are optimizing your website for the search results in Google. However, Google Analytics can be used for more things than simply keeping a tab on the rankings of the website. Here are some of the ways you can make use of this tool to improve your website and its design with the best SEO practices. Google Analytics can be used to collect various kinds of data from your website. The information so collected can give you invaluable insight to the behaviors and interactions of your customers. All you need to do to use this tool is sign up. Once you have signed up, you can get a detailed look at various important metrics and data. You will discover from where the traffic to your site originates. The keywords being used to discover your site will also be mentioned. The tool will also show you how much time is being spent on your site by the people. It will also tell you the pages which are being visited. The buttons or links that have been clicked will also be shown. 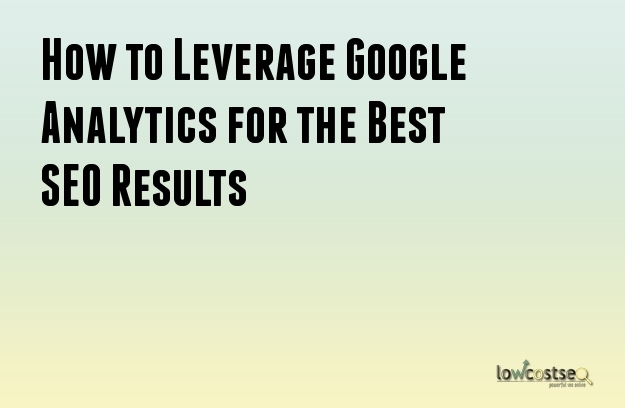 There are different ways you can make use of Google Analytics in improving your website. Given below are some of the ways. You can get a complete and detailed overview of the activities taking place on your site over the course of several months and even years. With Google Analytics, you can find out how the activities of the customers and the visitors have changed with time. You can discover the locations from which your audience and customers are visiting your site. In other words, you can track if your website is getting enough visits from the locality you operate in. Alternatively, you can check if you are getting national or even international visitors. Of course, these details will help you determine if the SEO is working in the market you want. Google Analytics will tell you about the keywords which people are using to discover your site on Google and visiting it. Once you know what the popular keywords for your website are, it becomes easier for you to use them. You can develop content that makes use of those keywords to target the customers. Google Analytics can provide you a variety of details about the visits of your audience and customers. You can check if people are returning to your website for more business or if new customers have come to you. You can find out which pages they are visiting the most and whether they are leaving too quickly. These details can be used to determine the strengths of your website as well as its weaknesses. You can take the proper measures as a result. As you can see, Google Analytics is quite a powerful tool. There are other incredible uses to this tool as well. Therefore, you should make sure that you have Google Analytics if you want to succeed at SEO.